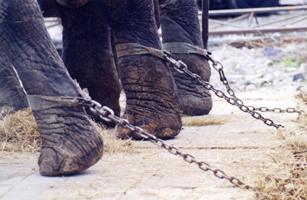 Animal Defenders International (ADI) is calling on compassionate members of the public to express their disgust that The Great British Circus plans to open its 2009 tour with Asian and African elephants. The circus opens on Friday February 27th at Newark, Nottinghamshire and performs until Sunday March 8th. When responding to an ADI query, Newark and Sherwood District Council reported that they did not have a ban on animal circuses and that they “never received requests from circuses”. After the Government missed an opportunity to ban animal circuses with the Animal Welfare Act 2006, when 80% of the public expressed a wish for wild animals to be banned, a Circus Working Group was established by DEFRA to gather and evaluate evidence. However, this has been roundly criticized for discounting much of the evidence before it could even be considered. More than 180 cross-party MPs have signed a parliamentary petition calling for the Government to fulfil its commitment to ban wild animals in circuses and to set up a proper licensing system for domesticated animals. EDM 965 is the animal welfare parliamentary petition with the third highest number of signatures, putting it in the top one per cent. Circus animals are not currently given protection under the Animal Welfare Act as circus regulations have not yet been written and DEFRA is expected to issue a feasibility study. ADI ‘Animals In Entertainment Campaigner’, Alexandra Cardenas, is available for interview. ISDN radio facilities are available at the ADI offices. 80% say ban all wild animal circus acts and 65% say ban all animal circus acts. *Brown, P. (February 6-12, 2009) ’Great British Circus plans ambitious programme to beat recession’. World’s Fair. Mortons of Horncastle Limited.